Just recently, founder and CEO of Bon’App, Laurent Adamowicz presented a TED Talk at TEDxBeaconStreet titled “Secondary Sugar Kills” In the talk, Adamowicz addresses the daunting truths and dangers behind sugar that’s hidden and added - or what he calls “secondary sugar” - in our foods, from burgers and pizza, to salad dressing, soup, crackers, bread, and even infant formula. In response to these stumbling facts, Adamowicz has recently launched EChO - Eradicate Childhood Obesity Foundation, Inc. that aims to address this shocking reality through political action, education, research, and outreach. This 501 (c)(3) not-for-profit foundation has recently launched the Front Label Act that aims to increase transparency in our foods. This Act requires, in addition to the existing nutrition fact labels, a tobacco-style warning that “Added Sugar Kills” as well as a label indicating total teaspoons of sugar in the entire package for all packaged and bottled consumer food products. We encourage you to watch the talk, check out the petition, and join the movement for a healthier America! How much Sugar would you like on your salad? How would you like to sprinkle granulated or powdered sugar on your favorite salad? That's in fact what most consumers do every day without realizing it. Industrial salad dressings, all of the major brands, from Hidden Valley Ranch to Wishbone to Newman’s Own are loaded with added sugar. And if you think the fat-free version will help with your diet, think again. It will generally have even more sugar. Check on Bon’App and be prepared for a shock! For example, a bottle of Hidden Valley Ranch salad dressing has 4 teaspoons of sugar. Look at the Fat-free Hidden Valley Ranch salad dressing; it has 12 teaspoons of sugar, three times more sugar than the regular one! The solution? Make your own tasty vinaigrette for the week, store it in your fridge, and live healthier. It is as simple as that. Here’s a little bit of historical background to understand how salad dressing was originally created, without sugar added to it. The only intention was making the salad tastier. Vinaigrettes generally include a fat component (such as vegetable or olive oil) and an acidic component (such as a citrus juice or vinegar.) One of the first vinaigrette recipes can be traced back to the 14th century. It appeared in Taillevent’s cookbook, Le Viandier. Guillaume Tirel (known as Taillevent in France) worked as head-chef for four kings of France throughout the 14th century. Taillevent’s vinaigrette recipe suggests using fat from cooked pork and sautéing some chopped onions in it. Once cooked, add some cinnamon, ginger, various spices, a little bit of saffron and vinegar. Boil these ingredients together and add some salt. Taillevent says you can enjoy this vinaigrette on your salads and/or fresh vegetables. Industrial salad dressings have evolved quite far from Taillevent’s original vinaigrette recipe. Driven by profit, the packaged goods industry started cutting back on these simple, basic ingredients. They began to add water (generally the number one ingredient in bottled salad dressing), flavor (to hide the fact that they use water instead of pure oil and vinegar), and lots of preservatives to make the dressing shelf-stable for months. They started adding sugar to their recipes, primarily because sugar is a cheap flavor enhancer that also helps extend shelf life. 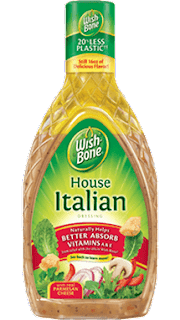 If you compare the ingredients between the Italian dressing you can make in 3 minutes with only 5 ingredients, the Wishbone Italian Dressing (18 ingredients), and the Hidden Valley Italian Dressing (19 ingredients), you may be shocked. Let’s be realistic, you would not suspect that a simple Italian vinaigrette dressing could be so unhealthy and full of added Sugar and various unpronounceable chemicals. The ugly truth is that it is. Here is a comparison between the DIY Italian Vinaigrette and the two leading competitors in the nearly three billion-dollar salad dressing industry of the U.S. market. 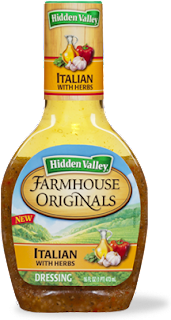 Hidden Valley Italian Dressing, 19 Ingredients: Water, canola oil, sugar, balsamic vinegar, vinegar, salt, honey, red wine vinegar, phosphoric acid, dried onion, dried garlic, dried red bell pepper, spices, xanthan gum, sorbic acid, sodium benzoate, potassium sorbate, calcium disodium EDTA, paprika extracts. Wishbone Italian Dressing, 18 Ingredients: Water, soybean oil, canola oil, distilled vinegar, sugar, salt, dehydrated garlic, dehydrated onion, dehydrated red bell peppers, maltodextrin, xanthan gum, spices, autolyzed yeast extract, calcium disodium EDTA, natural flavor, lemon juice concentrate, caramel color, annatto extract. We challenge you to start making your own vinaigrette dressings, devoid of added Sugar, useless chemicals, and water that should have never been a part of the recipe to begin with. Making your very own dressing will empower you to change the way you approach food altogether. At Bon’App, we are committed to bringing you a nutritious lifestyle, which is why we have provided you an incredibly simple Italian Vinaigrette recipe to get you started. Preparation: Add the 3 tablespoons of vinegar, 1 teaspoon Dried Oregano (or dried basil), ½ teaspoon salt, ½ teaspoon pepper in a bowl and stir well. Add 6 tablespoons olive oil and stir well again. Done. Tips: Store at room temperature for use in the next two hours, or in the fridge, up to a week, for future uses. Stir well before serving to emulsify again, similarly to when you originally made it. Don’t be afraid to experiment with and customize your vinaigrettes. In fact, that is how you’ll discover the perfect vinaigrette to complement your salad. For instance, you may add ½ clove of crushed garlic or a touch of dried garlic to spice up your salad dressing. As always, we wish you bon appétit!